Macromolecules are very large molecules. Their molecular weights can range from the thousands to the millions. They can have very different shapes, although the most common structure involves a long chain. Typically they are constructed from small, repeating units linked together to form this long chain. These macromolecules are also called "polymers". Polymers are made of many small molecules linked together. These molecules are linked or "enchained" by covalent bonds. The small molecules that come together to form polymers are called "monomers". Sometimes small numbers of monomers can come together to form medium-sized molecules; there might be two repeating units, forming a dimer, or three repeating units, forming a trimer, and so on. These mini-polymers are often called oligomers in general. The most common, naturally-occurring polymer in the world is cellulose. Cellulose is found in plants, where it plays an important structural role, lending strength to cell walls. We use cellulose fibers in a variety of applications. Cellulose from wood is the major component of paper and cardboard. Cellulose is also obtained from cotton fibers and is used to make fabric, usually for clothing. Paper currency is made of cellulose, too; usually the source is cotton, as well as some amount of linen. Cellulose is made of a long chain of sugar units strung together in a chain. In the picture, the dashed lines indicate that the chain is continuing on. The individual sugar units are all D-glucose. These polyhydroxylated rings are all enchained in exactly the same way, forming a repeating pattern from one end of the molecule to the other. It is very common to depict polymers with this repeating unit shown in parentheses. A subscript number after the parentheses indicates how many times this unit is repeated. If the number isn't known, this variable is indicated with the letter n.
The polymer is formed by enchaining a number of glucose monomers together. The particular form of glucose is α-D-glucopyranose. At the ends of the polymer chain, there are two hydroxyl end groups. When drawn this way, the etching of the polymer hardly differs from how we would depict the monomer. The world's second-most common, naturally-occurring polymer is lignin. Like cellulose, lignin is found in the cell walls of plants, where it provides strength and structural support. However, lignin is generally associated with woody plants, and it is much stronger, less flexible and more durable than cellulose. In fact,because of this durability, the removal of lignin from wood pulp poses a significant obstacle during the paper manufacturing process. 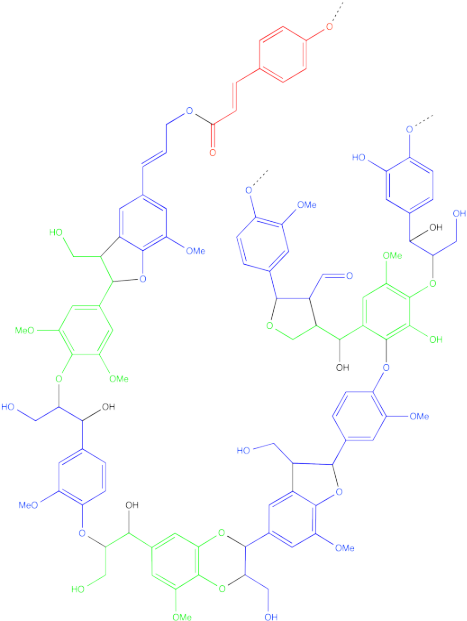 Lignin has a more complicated structure than cellulose. It is also formed from monomers, but the structures of those monomers are less regular than in cellulose. Furthermore, they are put together in more complicated ways, rather than all being joined together in an identical fashion. Like lignin, proteins are also formed from multiple types of monomers. However, these monomers are all enchained in exactly the same way. Proteins have a perfectly repeating "backbone", although the "pendant" groups attached to this backbone vary from one unit to another. In the picture, this backbone is shown in red. We can simplify the drawing by denoting all of the black, variable pendant groups as "R". As with cellulose, the picture of the polymer, when drawn this way, looks very much like a picture of the monomer. In either case, there is an acid-base equilibrium involving the amine group and carboxylic acid group in the monomer, or what are termed the N-terminus and C-terminus in the polymer. Commercial polymers are used in almost all aspects of daily life. Like the common biopolymers, they are constructed of small monomers assembled into long chains. Many common polymers are familiar to us from the recycling codes on the bottom of bottles and other packaging. 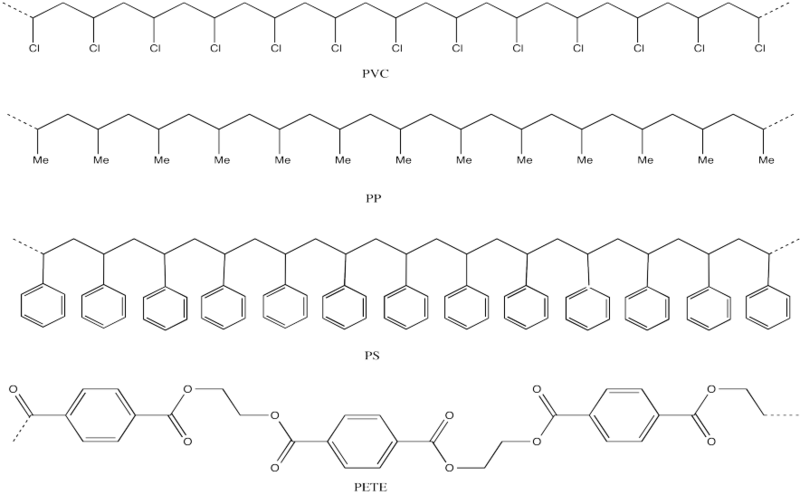 Drawings of these polymers (see problems below) illustrate that most of them have a long "backbone" with "pendant groups" attached periodically along that chain. Mcuh of the properties of commercial properties arise from that long chain structure. The different properties of these structures stem from the differences in those pandant groups, as well as alteartions in the backbone structure from one polymer to another. Revise the following drawings to show the repeating unit in parentheses. 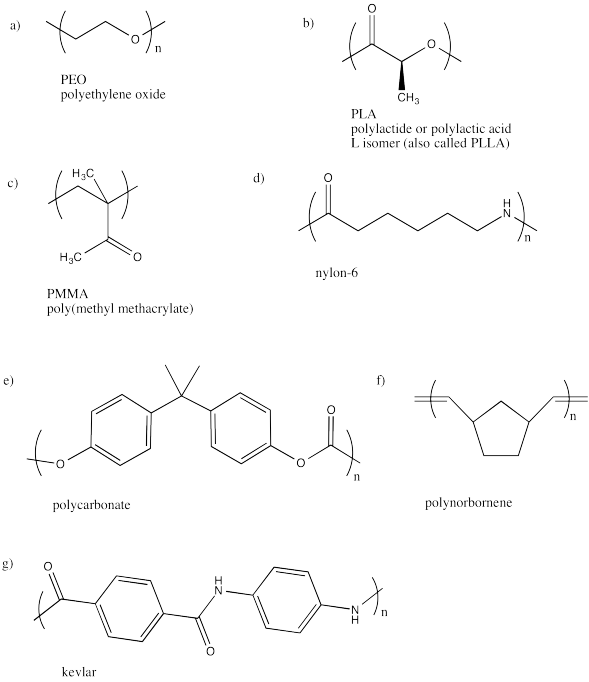 Expand the following polymer structures to show at least three repeating units. Find an application for each of the polymers in the previous question..
HDPE and LDPE have very similar structures. Like several other common polymers, such as PVC, PP and PS, they are olefin polymers in which the monomer makes a two-carbon repeating unit that appears in the backbone. a) Looking at the structures of both polymers, provide a structural picture in which the repeating unit is shown in parentheses. b) LDPE has a slightly lower density than HDPE. Explain why.